The Best Grammar blogs from thousands of top Grammar blogs in our index using search and social metrics. Data will be refreshed once a week. Grammar newsletter is a comprehensive summary of the day's most important blog posts and news articles from the best Grammar websites on the web, and delivered to your email inbox each morning. To subscribe, simply provide us with your email address. San Francisco About Blog Grammarly makes sure everything you type is easy to read, effective, and mistake-free. Their mission is to improve lives by improving communication. Facebook fans 7,109,650. Twitter followers 151,628. About Blog Free daily English grammar lessons and exercises. Be first to know when grammar rules change. Subscribe to our blog for free updates, lessons, exercises, videos, and much more. Facebook fans 553,680. Twitter followers 22,213. Manchester, UK About Blog Daily IELTS lessons with Simon, ex-IELTS examiner. Simon provides tips for writing, reading, speaking and listening and helps you improve your vocabulary and grammar. Facebook fans 576,749. Twitter followers 1,271. About Blog Whether you are an attorney, manager or student, writing skills are essential to your success. The rise of the information age – with the proliferation of emails, blogs and social networks – makes the ability to write clear, correct English more important than ever. Daily Writing Tips is about that. Every day we publish a new article, with topics ranging from grammar to punctuation, from spelling to usage and vocabulary. Facebook fans 33,921. Twitter followers 93,521. San Francisco, CA About Blog A subreddit for questions and discussions about grammar, language, style, convention and punctuation. Facebook fans 1,064,296. Twitter followers 456,834. Northern California About Blog The Grammar & Punctuation Resource on the Internet! English grammar rules, capitalization, punctuation, whom, whomever, whoever, writing numbers, apostrophe, and The Blue Book of Grammar. About Blog The best way to teach and learn English grammar. Lessons and exercises teaching grammar with sentence diagramming. Run by Elizabeth O'Brien. Facebook fans 235,322. Twitter followers 5,637. United States About Blog We offer English grammar lessons for beginners (full course) and other levels (elementary, pre-intermediate, intermediate and advanced). We study how to learn English speaking easily. You'll also see lessons for English speaking pratice, tenses in English grammar with examples, all english tenses. Facebook fans 3,988. Twitter followers n/a. About Blog Basics of English Speaking for Beginners. Facebook fans 2,817. Twitter followers 28. United Kingdom About Blog Love English with Leila and Sabrah is here to help you learn, improve and perfect your English! Grammar, vocabulary, idioms, pronunciation, academic English, IELTS, exam skills and even British culture. Our online lessons have it all. Facebook fans 2,002. Twitter followers 243. Barcelona, Spain About Blog ABA Journal is the most affordable and personalized online English academy. They will definitely help you learn English. Facebook fans 1,377,758. Twitter followers 22,033. Toronto, Canada About Blog engVid brings you free English video lessons every day. Facebook fans 868,656. Twitter followers 69,221. New York City About Blog Engaging and informative grammar and writing tip sheets for teachers, and practice pages and fun games and activities for students in Grades 3–12. Facebook fans 2,560. Twitter followers 815. Facebook fans n/a. Twitter followers 3,142. About Blog Clark and Miller is a place for advanced learners to get awesome at English. With a mix of free and premium stuff, from blog posts to one-to-one lessons on Skype, you’re in the right place to go from just “knowing” English to using it like a pro!" Facebook fans 1,436. Twitter followers 624. Petaluma, CA About Blog We answer all your grammar questions with easy-to-use grammar books; our blog; and grammar workshops, classes, and presentations for groups of all types. Facebook fans 1,212. Twitter followers 2,836. About Blog Our lessons cover areas such as English grammar, vocabulary, listening skills, reading skills, speaking and pronunciation, punctuation and writing. Facebook fans n/a. Twitter followers 40,042. About Blog Daily Grammar is a fun, convenient way to learn grammar. By simplifying complex grammar subjects, Daily Grammar can be used for children or adults of all ages and learning levels. By practicing language rules, any person able to read will be able to master English grammar . About Blog Improve your English Grammar, Speaking, Listening, Reading and Writing Skills Here! Facebook fans 1,755. Twitter followers n/a. India About Blog Parts Of Speech is a Learning place. Here you find interesting grammar related quizzes and exercise for your practices. It is a platform which will help you to improve your grammatical knowledge. Facebook fans 149. Twitter followers 7. Asia About Blog Blogging on topics of interest to ESL teachers and students. Washington, DC About Blog Read what writing experts say each week about all aspects of writing and style—from publication ethics to precision in reporting research to reference style and the clear expression of ideas. Facebook fans 31,197. Twitter followers 20,333. About Blog English page is a free website to learn and improve your English skills. We provide lessons in grammar, vocabulary, speaking etc. We also offer different exercises and quizzes in the English language. Our focus is mainly communication and conversation; therefore, our lessons often give opportunities for our visitors to learn new vocabulary, phrases or useful conversational sentences. About Blog No problems yet to learn grammar with a simple, fun and easy to understand by simply need to learn via video. Let's learn grammar. About Blog English teaching blog by Jabz Tshabalala. About Blog Pep Talk is India's No.1 English & public speaking institute not just in words but also in transformation ratios. Facebook fans 36,230. Twitter followers 19. About Blog This is a blog about English grammar written by Bas Aarts, a grammar enthusiast and Professor of English Linguistics at UCL. It is linked to the Englicious website for teachers of English. The main aim of the blog is to discuss points of grammar. Facebook fans 2,211. Twitter followers 1,135. Oxford, UK About Blog Do you have any pressing grammar questions? Need help with your writing? This is the place for you. Facebook fans 737,703. Twitter followers 286,322. About - Daily IELTS lessons with Simon, ex-IELTS examiner. Simon provides tips for writing, reading, speaking and listening and helps you improve your vocabulary and grammar. About - My name is Lisa and I have been a teacher of English to speakers of other languages for over twenty years. Teacher of English as a foreign language. My learning motto is 'little and often'. Helping you learn English, one tweet at a time..
About - Do you have any pressing grammar questions? Need help with your writing? This is the place for you. About - British English teacher based in the UK. All the latest Intrepid English news, useful grammar, vocabulary and pronunciation lessons and tips to help English learners. 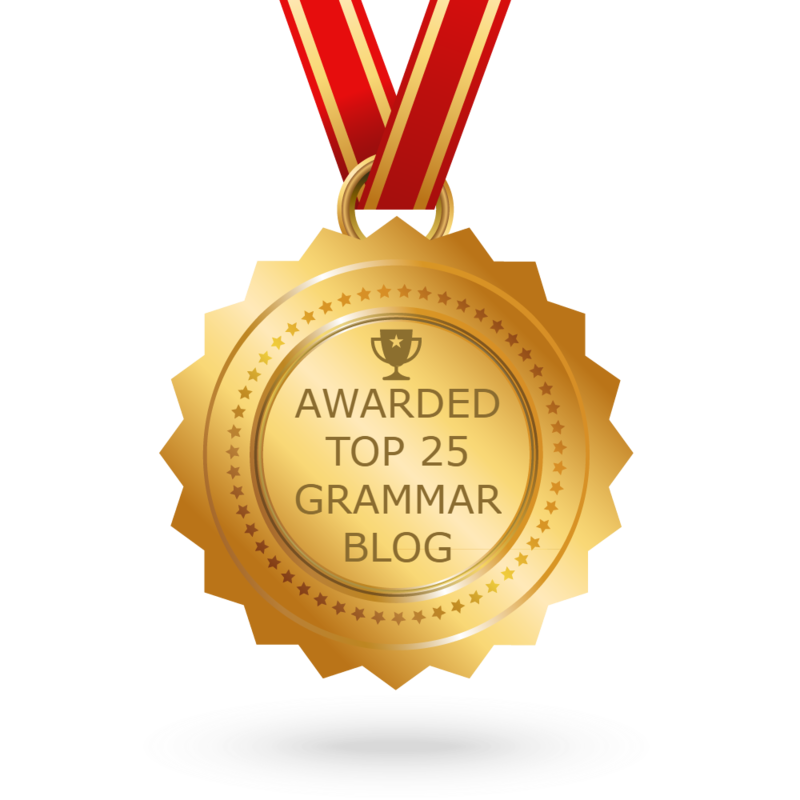 CONGRATULATIONS to every blogger that has made this Top Grammar blogs list! This is the most comprehensive list of best Grammar blogs on the internet and I’m honoured to have you as part of this! I personally give you a high-five and want to thank you for your contribution to this world.